To emphasize its agency tenets—and reclaim the tactile graphic arts for ad land—Odysseus Arms is building a collection of self-promo posters worth framing. "We're using the posters to raise craft level at OA, connect to our community of designers, typos and craftsmen, and have fun making posters," says chief creative Franklin Tipton. The San Francisco agency has made nine posters so far; the plan is to create 50 total. Of the one you see above, Tipton says, "This is a poster that no holding-company ad agency could ever make. This is why you partner with an indie agency." The imagery is a treat, bringing to mind '70s albums, the Nouvelle Vague, early-'90s tech aesthetics, even Sailor Jerry tattoos. Below is our interview with Tipton, followed by the other eight posters that exist so far. Some have liner notes, so watch for those. 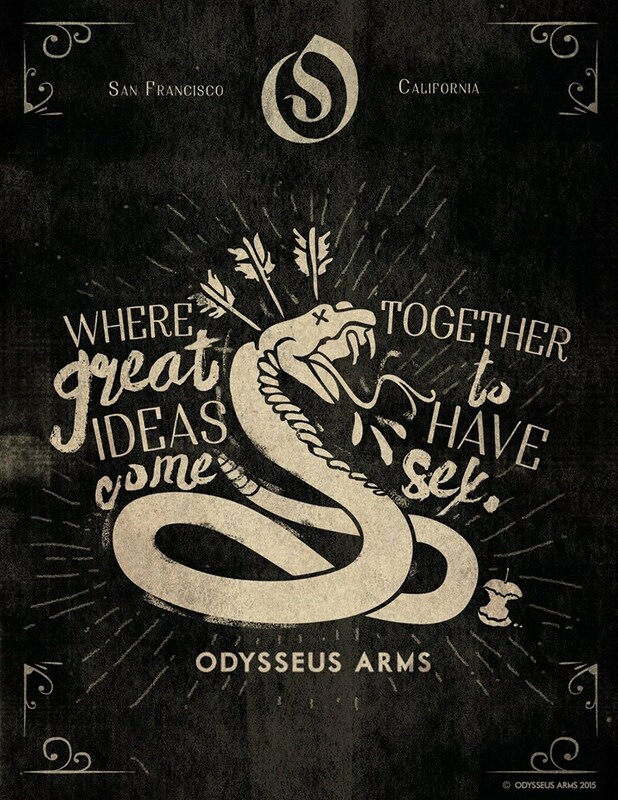 AdFreak: Tells us where the name Odysseus Arms comes from. Franklin Tipton: We're into big storytelling. Odysseus was the hero of the greatest story ever told. We're taking our best shot at killing off that stupid notion that misogynistic, scotch-soaked Donald Draper-types work in our industry. Everyone we know works their asses off to make their clients famous and dynamic (and profitable). We see branding as an elegant pursuit. "Arms" just telegraphs the modern agency model; there are so many vertical disciplines out there, you need to have a multitude of specialty partners, or arms, to service the modern contract. Every agency has arms. What inspiration did you draw from to produce the posters? The posters do a bunch of things at the same time. First, the world has been "Tinder-ized": We swipe through content at a blindingly fast rate. Stopping people and fascinating them is often down to powerful "key art." Posts on Instagram and Facebook, movie posters, cover art for games, retail signage and, of course, display media owe any attention they get to singularly stunning images. So we use the poster series to teach, experiment with and practice "key art" craft. The other thing posters do is connect us to new talent. The project is populated by a constellation of young street artists, designers, letterers and old-schoolers. Before the MP3, there was Tower Records, which, looking back, was closer to a museum gallery of album art rather than merely a retail space. We're trying to achieve the visual variety of an old record shop. Would you say these constitute a series of fixed agency values? Definitely. Media is far more interesting than it was 10 years ago, but we see craft and copy suffering from things like HTML fonts and project economy timelines. Our values push back on these pressures, reinforce the importance of our industry and artfully express best practices. One of the most curious things that we've been exposed to through working with Facebook in Menlo Park is their Analog Research Laboratory; it's a cold type print shop located right across from Oculus. One of the largest technology companies on earth appreciates the tactile quality of a hand-printed poster. We see our posters as a stab at permanence in a world where content disappears into the cybersphere in a flick. How did you choose the values to highlight?